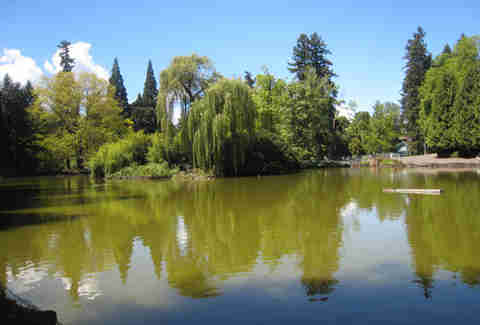 Portland's parks aren't just pretty. They’re part of everyday life. From free outdoor movies and disc-golf courses to neighborhood kickball tournaments and concerts, Portland parks are all about owning Stumptown. So get out there and take back the power. 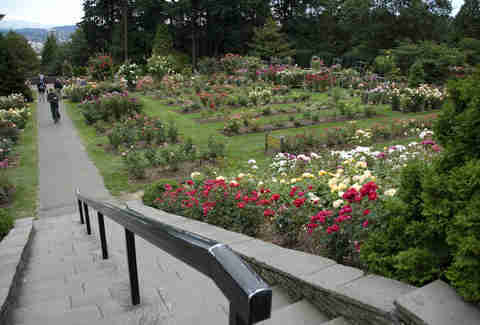 There are dozens of parks in the city. These are the 15 best. And if you disagree, tell us what we’re missing in the comments. 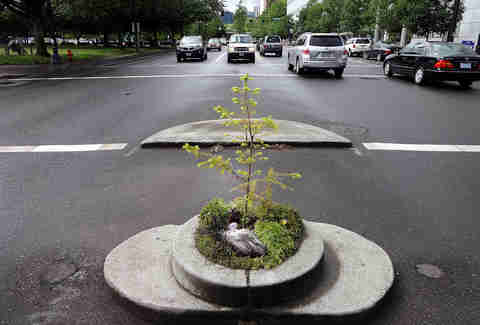 I'm only mentioning this downtown park for its ludicrous claim to fame: it's the smallest park in the country. And right now it looks like someone's abandoned Charlie Brown Christmas tree. It's worth the drive to industrial NoPo to enjoy secluded lakes full of wildlife hidden among the warehouses and other creepiness. In his guide to Portland, Chuck Palahniuk recommended this place... and still nobody goes here. For great swimming and a taste of what it would be like to own a private island, head here during the summer. Be prepared to wade across 20ft of shallow water as part of the journey (though, with this year's water levels, you may be in luck). You never know what you'll see in the Park Blocks. Really. It could be the Unipiper, a horde of bar-hopping superheroes, or just some geezer talking to squirrels. And while it’s maybe a cheat to put the entire stretch down as one park, well, deal with it. Because it basically is one long park. What does it overlook? A massive train yard. But it's still a gorgeous park, with sports facilities and a climbing tree straight out of Swiss Family Robinson. It's also home to the North American Organic Brewers Festival. And also the best damn train-yard views in Portland. 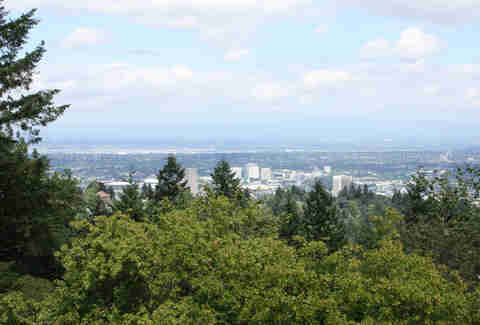 The highest point in Portland’s West Hills isn’t just a place to make out when you're in high school. It's also a great place to make out when you're an adult. A true urban park, it has a duck pond, basketball courts, a huge off-leash area, and paved walking trails that weave among ancient Douglas firs. It's all about the free disc-golf course -- the best in the city. 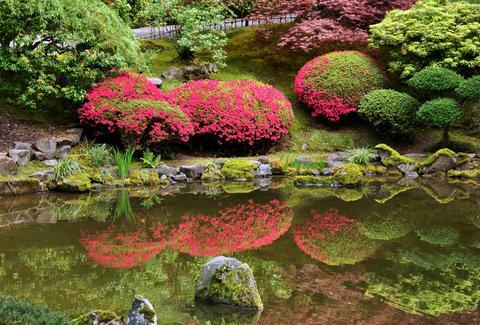 Here, you'll find the Oregon Zoo, Hoyt Arboretum, the World Forestry Center, the International Rose Test Garden, the Japanese Garden, the Children's Museum, and the Vietnam Veterans Memorial. There's also an archery target range, just in case you're feeling all Men in Tights, and endless hiking trails, in case you miss the target and need to flee. 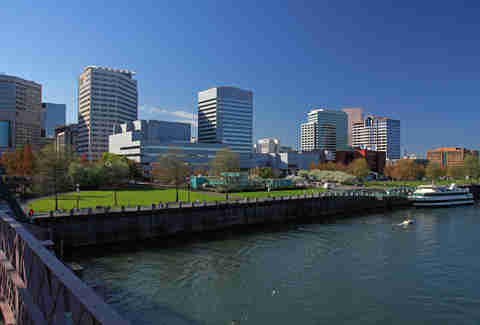 It has better views of the city than any other Portland park, and it's free to tour the grounds. 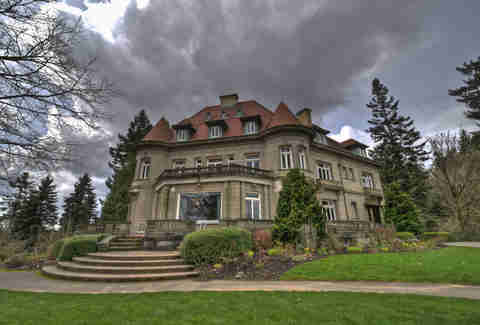 Tours of the sprawling mansion cost $10, which isn’t a bad price if you like creepy toys: the Pittock kids’ playroom is straight out of the Bride of Chucky. Hang beneath the St. Johns bridge without looking like you're homeless (unless that's your thing, then that's cool. Keep doing it. It is pretty cool.). It's also home to the longest continuously running free jazz festival West of the Mississippi. Not long ago, it was just a place for ruffians and scallywags to day drink. Now, it's where the city day drinks. And sunbathes. And runs. And throws beer festivals and giant concerts. And does pretty much everything else. 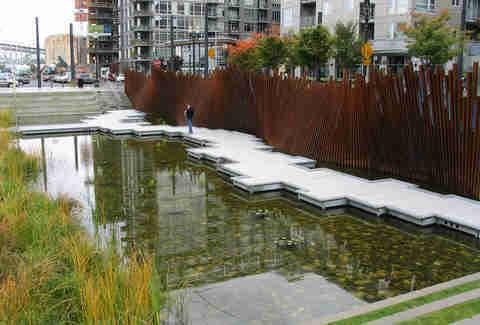 Located 20ft above what was once Couch Lake in the Pearl, this urban wetland lets you walk across the water on zig-zagging paths surrounded by a massive art installation involving 368 railroad tracks. A prime location for Concerts in the Parks, the city's second-best park serves up views of Hawthorne Boulevard from an extinguished volcano cone. Touting turrets, the reservoirs are pretty, too, so long as no one is causing E. coli scares by going potty in them again. It’s also the home of the Adult Soap Box Derby, which is exactly what it sounds like and twice as incredible. 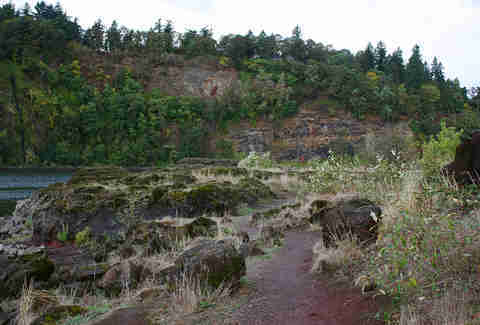 Portland's Forest Park is the largest urban park in the United States, and the Wildwood Trail has 30 miles of hiking trails just 10 minutes from the heart of downtown. 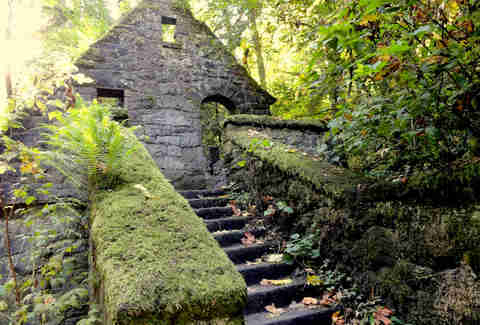 The Macleay Trail is particularly sweet: it passes an abandoned stone house filled with Satanic graffiti before winding up to Pittock Mansion.